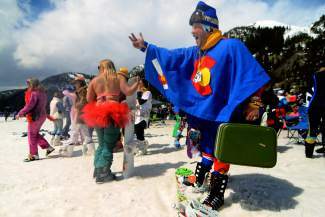 Andrew Vossberg, 30, of Breckenridge, dressed as "Joe Colorado" for Gaper Day at Arapahoe Basin Ski Area on April 1, 2015. He joked that when he left the ski area he would put on Chaco's sandals in his Subaru, and said, "If you can't pick fun at people then that's not Gaper Day." 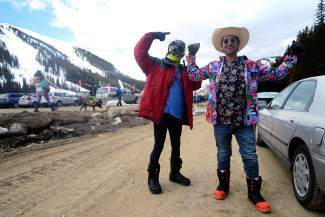 Hundreds of people arrived at Arapahoe Basin Ski Area on Wednesday, April 1, 2015, dressed in neon, denim, sequins, spandex, velour, cowboy hats and wigs to celebrate the annual tradition of Gaper Day. Ward Malek, left, kisses Keith Van Iderstine, both 33, of Breckenridge, at Arapahoe Basin Ski Area on Wednesday, April 1, 2015. Malek said his 1980s outfit came from a friend of his parents, and the trim happened to exactly match Van Iderstine's jacket, which was worn by Van Iderstine's sister in the early 1990s. Kelly Lundeen, left, 25, of Loveland, is jokingly harassed by Dan Williams, 28, of Breckenridge, at Arapahoe Basin Ski Area on Wednesday, April 1, 2015. Lundeen wore a dreamcatcher from one ear while Williams sports a borrowed ski resort mountain safety jacket. 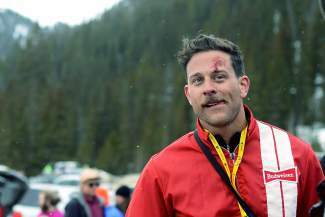 One man cut his forehead while doing a trick off a small jump at Arapahoe Basin Ski Area on Wednesday, April 1, 2015, during Gaper Day festivities. 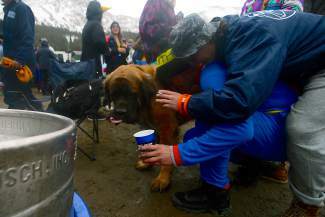 Partiers at Gaper Day at Arapahoe Basin Ski Area on Wednesday, April 1, 2015, share some affection with a dog named Apa. Brett Lomoro, 33, of Breckenridge, poses for a photo with a Gaper Day partier at Arapahoe Basin Ski Area on Wednesday, April 1, 2015. 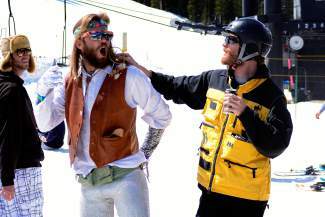 Jake Hensley, left, 22, of Denver, and Jared Berman, 24, of Summit Cove, dressed up for Gaper Day at Arapahoe Basin Ski Area on Wednesday, April 1, 2015. 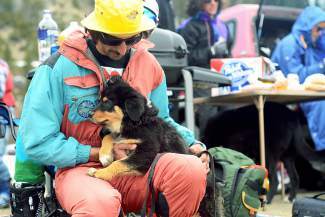 Pat Childs, 24, of Silverthorne, brought his 3-month-old Australian shepherd puppy, Penny, to Gaper Day at Arapahoe Basin Ski Area on Wednesday, April 1, 2015. 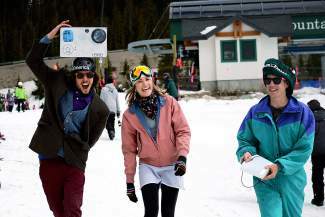 From left to right, Corey Hague, 27, of Breckenridge, Meagan Gliott, 23, of Breckenridge, and Daniel Stange, 26, of Fort Collins, dressed up for Gaper Day at Arapahoe Basin Ski Area on Wednesday, April 1, 2015. 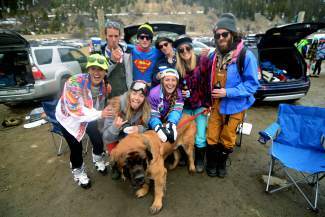 Employees of other local ski resorts were prohibited from skiing or riding at Arapahoe Basin Ski Area on Wednesday, April 1, 2015, as the ski areas have tried to rein in Gaper Day festivities over the years citing concerns about safety and harassment. Josh O'Brien, 27, of Breckenridge, wore three pairs of sunglasses and carried too-tall ski poles during Gaper Day festivities at Arapahoe Basin Ski Area on Wednesday, April 1, 2015. 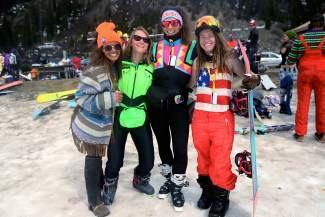 From left to right, Becca DeGrate, 26, of Breckenridge, Emma Paul, 29, of Lakewood, Bianca Germain, 26, of Highlands, and Andrea Belbusti, 26, of Denver, gathered at Arapahoe Basin Ski Area on Wednesday, April 1, 2015. 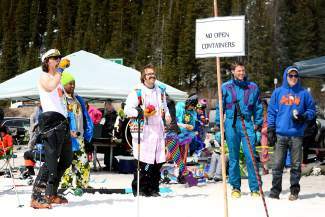 Breckenridge roommates Sylas Stansfield, 25, Skylar Ray, and Kyle Brochu, 25, took part in Gaper Day festivities at Arapahoe Basin Ski Area on Wednesday, April 1, 2015. 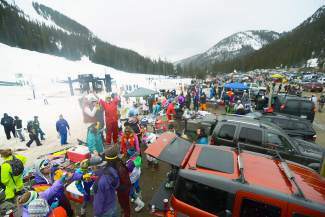 A couple hundred people gathered at Arapahoe Basin Ski Area on Wednesday, April 1, 2015, for the annual tradition of Gaper Day. 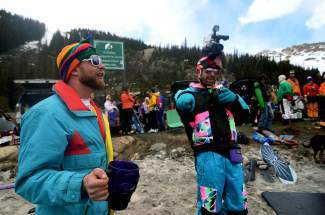 J.J. Friedman, left, 29, and Brett Lomoro, 33, both of Breckenridge, took part in Gaper Day festivities at Arapahoe Basin Ski Area on Wednesday, April 1, 2015. 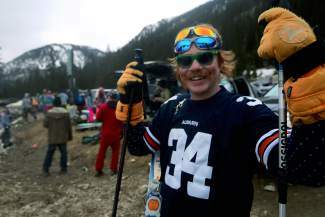 A goofy tourist, suggested Jake Hensley, a 22-year-old from Denver as he geared up in the Arapahoe Basin Ski Area parking lot for the annual April Fools’ Day tradition known as Gaper Day. He added an acronym: Guaranteed Accident Prone Every Run. All skiers and riders start out as gapers, said his friend Jared Berman, 24. The Summit Cove resident wore jeans, a cowboy hat and colorfully patterned shirts. It’s like puberty on the mountain, he said. 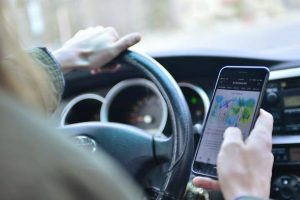 Down on the Beach, the strip between the ski area’s lower parking lot and its Pallavicini chairlift, where hundreds gathered on Wednesday, April 1, another group pondered the term. “Anybody from Texas,” said Becca DeGrate, 26, of Breckenridge, wearing a poncho and a neon hat. Dressed in an American flag outfit, Andrea Belbusti reminded her friends that the word originated from the gap between an inexperienced skier’s helmet and goggles. “Every day’s Gaper Day for me,” said Belbusti, 26, of Denver. She considered Wednesday her 15th Gaper Day of the season because she always snowboards in funny clothes. Another Front Ranger, 26-year-old Bianca Germain, said “gaper” has evolved to mean anything silly and crazy and the word now encompasses the wide variety of dress at the Basin. 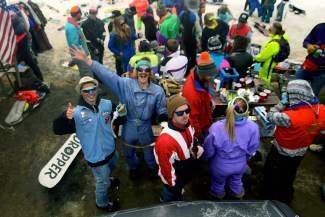 The Gaper Day crowd looked larger than it was last year, said Patrick O’Sullivan, A-Basin risk manager, as he worked to keep people from bringing alcohol from the Beach toward the ski area’s buildings and main lift. Grills, dogs, boom boxes, corn hole games, lounge chairs abounded on the Beach as people roamed around wearing neon jumpsuits, bright shiny spandex, denim, fanny packs, mullets and wigs. 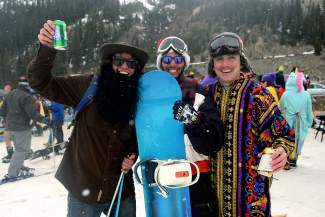 Some partiers said the ski area seemed stricter about Gaper Day than in years past, with A-Basin employees searching them for alcohol before they could ride the chairlifts. With the entire Beach available for drinking and joking around over “hold my beer and watch this” moments, most didn’t seem to mind. Other Gaper Day–goers were upset that they weren’t allowed to ski or ride if they worked for Vail Resorts. 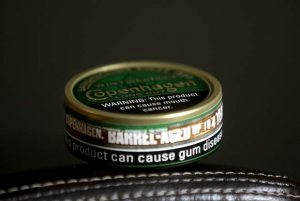 Local ski areas and government and law enforcement officials stayed quiet about the event this year, but the resorts have cited past incidents involving intoxication, safety problems and harassment as the reason behind their efforts to quash the festivities. Though Gaper Day regulars said the occasion has grown quieter over the years, the day is still a party. 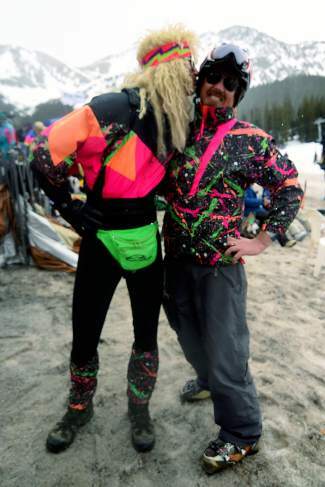 Breckenridge resident Brett Lomoro, 33, said he remembered only one obnoxious person at last year’s Gaper Day at A-Basin. This year he came with about 40 friends, and they were trying to rein in the shenanigans and bring it back to its 1980s roots, he said. Lomoro wore a neon blue, pink and green outfit and, strapped on his helmet, a camcorder larger than his head. The idea was to poke fun at people unknowingly dressed like he was, he said. His friend J.J. Friedman chimed in. A Front Range couple skiing in Summit County with their two young boys for spring break spent the day at A-Basin and explained to one of their sons that what he smelled was a skunk. 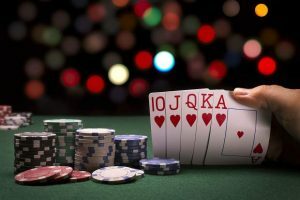 “We brought our kids, and they’re really into it,” said Melinda Roszman, 43, of Denver, of her 8-year-old son, Luke, and 7-year-old son, Finn. She and her husband didn’t realize the occasion poked fun at tourists at first, but they thought it was funny and enjoyed the atmosphere and throwback styles.